believe that if they turn in their abusers, no one else will take care of them. When the caregivers are their children, they may be ashamed that their children are behaving abusively or blame themselves: “If I’d been a better parent when they were younger, this wouldn’t be happening.” Or they just may not want children they love to get into trouble with the law. In 2010, North Carolina's 100 county departments of social services received more than 18,000 reports of abuse, neglect or exploitation of vulnerable and older adults. Reports are made by doctors and other health care professionals and by family members and concerned citizens in our communities. Most reported elder abuse in North Carolina (85 percent) happens to adults older than 59 who live alone or with family members, while the remainder happens in facilities or shelters. The most common form of mistreatment is neglect, with 69 percent of the cases involving self-neglect, where victims are unable to care for themselves adequately. Anyone who suspects that a vulnerable or older adult needs protection is required by North Carolina law (General Statute 108A-102) to report this information to the adult protective services intake unit at the department of social services in the county where the adult resides. Visiting the Eldercare Locator website at: http://eldercare.gov/Eldercare.NET/Public/Index.aspx to find help in your community or by calling 1-800-677-1116. If you have been the victim of abuse, exploitation, or neglect, you are not alone. Many people care and can help. Please tell your doctor, a friend, or a family member you trust, or call the Elder-care Locator help line immediately. 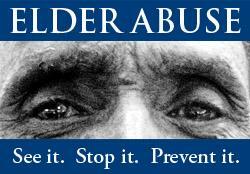 You can reach the Elder-care Locator by telephone at 1-800-677-1116. Specially trained operators will refer you to a local agency that can help. The Elder-care Locator is open Monday through Friday, 9 am to 8 pm Eastern Time.